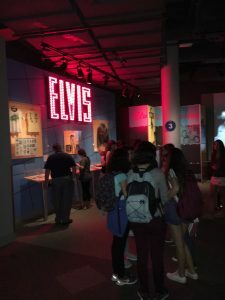 If you like music, and I’m talking music from the 50s straight on through the first decade of this century, then by all means you need to get yourself to the Rock & Roll Hall of Fame in Cleveland. I was there recently and can certainly recommend it for those folks who fit into the category I just described. You’ll find yourself immersed in all that the Hall has to offer. I was there three hours and I’m sure I didn’t see it all. It opened with much fanfare in 1995. It was Alan Freed who coined the term rock and roll in 1951. The first actual rock concert was March 1952 (not at the Hall) and a riot ensued by patrons storming the stage. The Hall is six floors with the main exhibit being on the lower level. It’s open daily from 9 to 5 with adult admission $23.50 and seniors $21.25, not much of a difference is there. You can buy your ticket in advance. What I also liked about the Hall of Fame is the location. It is situated on Lake Erie adjacent to the Great Lakes Science Center and the Browns football stadium. That gives you impressive views of the lake and on the other side the city skyline. And as an aside, the city of Cleveland has come a long way. The downtown area is vibrant with hotels, shopping, restaurants, museums and residential space. One of the exhibits is something called The Power of Rock. It’s 12 minutes and it is included in your ticket. It’s basically the story of just about all of the past inductees. You rockers will love it. It concludes with Prince. Speaking of inductees, next year the ceremony will be held in Cleveland rather than New York. I think that makes sense. Foster Theatre; Level Five, Alan Freed Radio Studio, Sirius XM, Rolling Stone/50 Years. As I mentioned, next door is the Great lakes Science Center. A beautiful two story building that is intended for all members of the family. Don’t leave the area without stopping in. Adult admission is $9.00 and it’s open Tuesday-Sunday. 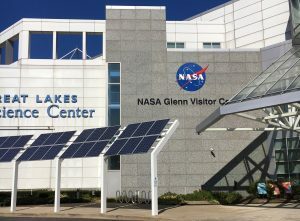 One of the current exhibits is the NASA Glenn Visitor Center. It’s loaded with all kinds of information about past space history. The Science Center is a museum and educational facility where many of the exhibits document the features of the natural environment in the Great Lakes region. IMAX film in The Dome. Now showing is Journey to Space and National Parks Adventure. Full length feature films are also shown in The Dome. There’s also All Aboard! The Science of Trains, Biomedtech, Cleveland Creates Zone, Science Phenomena and the William G. Mather Steamship outside. For more information go to greatscience.com.